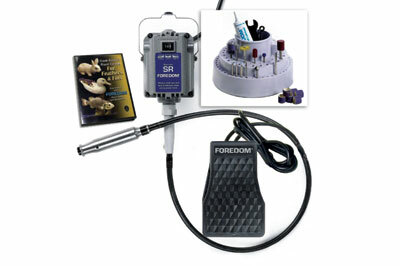 The Foredom K5240 Power Carving Kit forms the basis of a very comprehensive set of power carving tools and attachments. Foredom has been producing quality tools for many years and this rotary flex-shaft power carving unit is said to be one of their best-selling models. Used in all kinds of disciplines, from woodworking to dentistry, this dedicated motor together with its various handpieces and attachments provide the user with a huge amount of choice and opportunity. I wanted to see how flexible and useful this tool could be and wondered if it could be a one stop shop for all my power carving needs. Included in the kit is the 3-DVD set, so I decided to watch the first installment before I used the tool. This gave me a very good introduction to the tool and how it works, but more importantly, it demonstrated the safe and correct use. The Foredom K5240 has a 1/6 HP reversible motor with a top speed of 18,000rpm. The main benefit of the reversible motor is to aid left handed carvers although, in some circumstances, being able to sand in reverse can be very useful. It is not advisable to carve material with the motor running in reverse as any slip could cause serious injury. The motor is attached to the handpiece by a long, flexible drive shaft. This is very well made and quite large in diameter. Each piece feels reassuringly solid and well-constructed. The kit includes the Foredom 44T handpiece, which is very comfortable to hold, and the design includes a flared end which allows the handpiece to rest in the hand and provides an excellent point of purchase. The tool comes with three collets which alter the diameter of shanks that can be used. It can cope with 4mm (4/32in), 3mm (1/8in) and 6mm (1/4in) shank sizes, which allows great flexibility when you are buying burrs and other accessories. Tip change is accomplished by using the supplied spanner and pin. These are attached to one another with a short length of chain, which ensures that you can always have the two tools together. The tools can be kept in the supplied tip caddy which runs on a Lazy Susan bearing; it is well made and can hold a lot of accessories. The tool is supplied with several good quality attachments which are enough to get you started; however, depending on the work you do, Foredom produces a very wide range of ancillary equipment. It is also worth noting that many other brands of tips and accessories can be used in the various handpieces. The motor is controlled by a foot switch which allows the user to hold and position the work and handpiece securely before starting the motor. This is a nice feature on the machine but I found it took a little while to get the hang of it. It is possible to use the foot switch to vary the speed of the motor but at first it was very hard to keep it constant at anything other than full power. Having said that, with repeated use, this process does get easier as you become more accustomed to the pressure required. The foot switch can be bypassed by plugging the tool directly into the power cord supplied; however, this limits the tool to work only at full speed. I started with the smallest bit. The first thing I noticed was the diameter of the handpiece; it is quite chunky to hold and is very comfortable. For general hogging out of wood the larger diameter made the process very comfortable and very easy. The carbide burr tips remove the wood at pace without generating much heat, unless too much pressure is applied. Dust masks and goggles are of course a must, as is point of source dust extraction. The tool was a joy to use with plenty of power and a good quality burr, and I was able to remove a lot of waste wood efficiently. 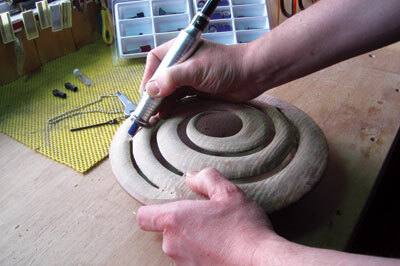 Having done so I wanted to refine the shape of the spiral; this was lighter, more intricate work but again the tool performed well. It is worth noting that a good tip is to start the tool gently. Due to the high power the motor can twist violently if you apply too much pressure too quickly to the foot switch. It can have the effect of pulling the flexi shaft, thus dragging the cutting tip into you or your work. Being unused to having so much torque in a flexi-tool, this took me a little while to get used to but it soon became second nature as experience was gained. the shape of the bit was tapered. This doesn't suit the kind of piercing I tend to do as the further I pushed the tool into the work the larger the hole became; however, the tip worked very well and I was able to cut away wood with ease. I then attached one of my own piercing bits, and again, the tool performed admirably and I was able to continue working on a piece. I did notice, however, that after some time piercing, due to the weight of the flexi shaft, the handpiece started to drag in my hand. Also, due to its overall size, the handpiece and shaft were a little cumbersome when it came to getting into really awkward areas. Foredom does offer a range of handpieces, and if you do very fine work then this could be something to investigate further. This is a very capable power tool. It has masses of power and torque enabling use on large or small projects. 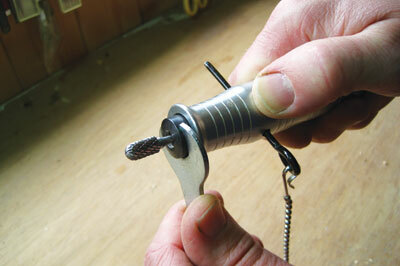 The handpiece is very comfortable in use although for finer work a smaller one may be beneficial. The motor is very smooth; it delivers more than enough power for working with wood. on the job in hand. The foot switch took me a little while to get used to but it's a really useful feature, allowing you to power carve specific areas comfortably and confidently. 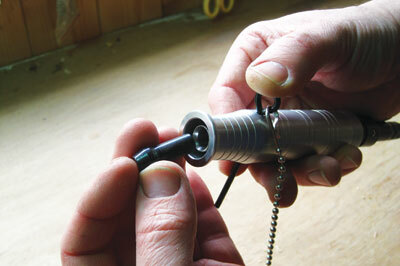 The torque of the motor is impressive; it's a tool that you can use in any circumstance and it will do the job. However, for very fine work such as intricate piercing, the drag of the flexi shaft and torque make it more difficult to use than with other rotary tools available. All in all, this is a very impressive bit of kit and I thoroughly recommend it. I treasured and used a Foredom TX for many years. I was eager to see how the SR unit compared, and I could not have been more pleased. Yes, it takes a bit of getting used to but this is a quick process and then it is a case of kitting out with burrs and accessories to suit what you want to do. This unit is superbly made, has oodles of power and, in my opinion, it is a piece of kit that is every bit as good as the TX.